I made it down to Country Workshops for one day only before stomach problems chased me back home, but it was well worth the drive. Jögge Sundqvist is an excellent instructor and extremely likable person. I learned a ton of things from him in a short period of time, such as: the correct way to use an axe and adze, and the details that must be considered in bowl design. The finished thickness of the walls and floor of the bowl is about 5/16". The ends, however, need to be three times as thick to account for the endgra in. Bowls are canted on the ends so the endgrain fibers are increased in length. This prevents liquid from leaching out of the ends and makes it less likely to crack. Wooden bowls were used for all manner of things including dough, meat, and milk. In Norway and Sweden, "ale geese" bowls were made to hold beer. During class, logs were split (taking care to avoid the pith), bark was removed, insides were hollowed, and outsides were carved to shape. There are several ways to dry a bowl at this point. If it's small enough, you can use a microwave. Larger bow ls can be stored in paper bags with air holes (which may result in spalting, so be careful) or wrapped in cloth and stowed in the basement or other cool place. You can even bury it in a pile of shavings for a few weeks. 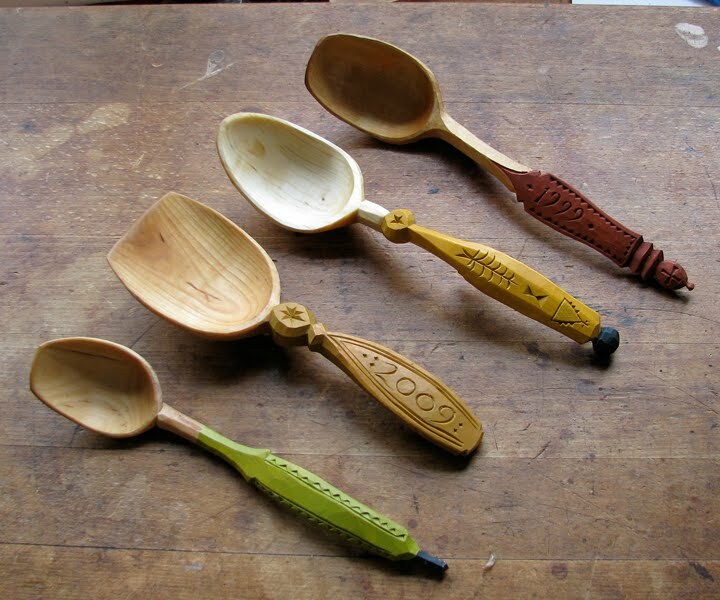 If you carve green wood, as we did, you'll have to wait until the bowl is dry to achieve a finished, smooth surface. 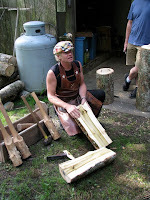 I missed the days spent on spoon carving and proper knife holds, unfortunately, but I have Jögge's video, Carving Swedish Woodenware, for reference. 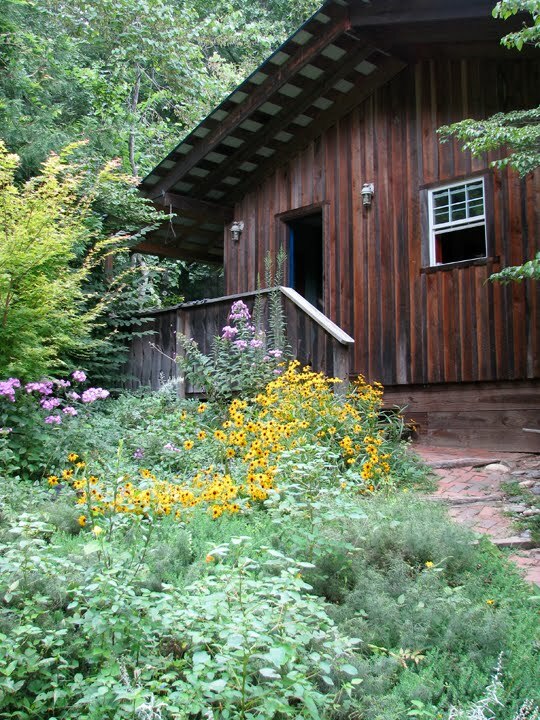 There are still spaces available in Jögge's next class, which is September 6-11. The video below will give you some idea of the layout and class structure. The owners, Drew and Louise Langsner, couldn't be more gracious. They are sweet, gentle people and Louise is a heck of a cook. When you take a class at Country Workshops, you become part of the family. The informal, friendly atmosphere and rustic, remote setting can provide the perfect getaway from a hectic life. The spoons above were carved by Jögge Sundqvist. 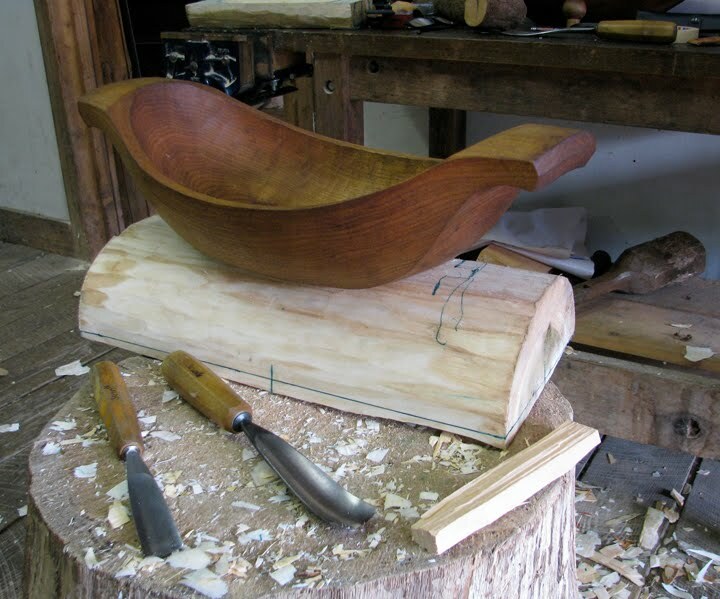 The bowl was carved by Drew Langsner. You can view the video in a larger format here. Designs for the bowl dogs we used at Country Workshops can be found in their free online newsletter.